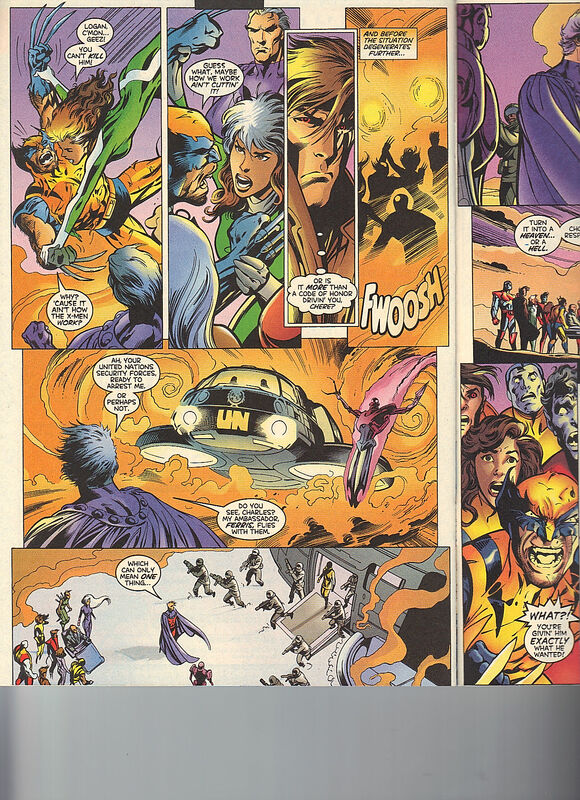 This is the fifth part of crossover, this was during Alan Davis’ awesome (but brief) tenure as both plotter and penciler, of both X-Men and Uncanny X-Men. I’m so happy that Mark Farmer came along for the ride. 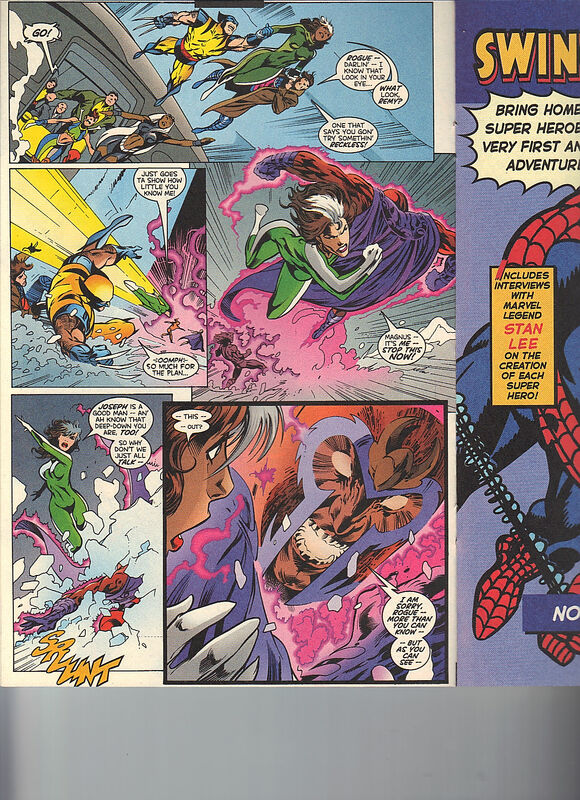 90s staple, Fabian Nicieza, assists with the script. I own all five parts of the crossover but I’m reviewing this one, now, as my final look back, for Magneto 21. I was super excited, when I pulled this out of my short box, when I saw the sliver of black strip that is on the right side of the cover. That meant, that this was part of the pull out cover, that reviewed the cast and the previous issues’ events. Except that at the end of that campaign, which I was a huge fan of, they used it as additional ad space, which makes sense. 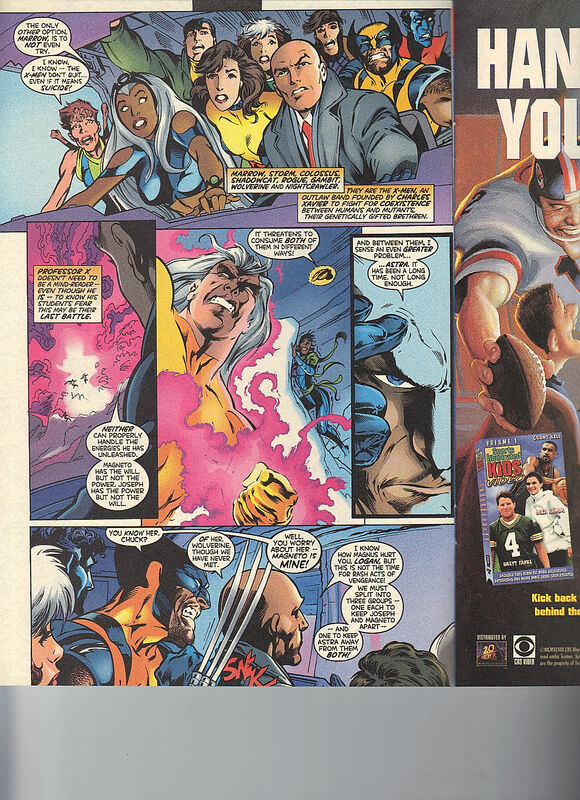 There is an ad for The Hulk, b John Byrne, Ron Rarney and Dan Green (whose name, I’m pretty sure, I lost track of, come May 1999). His wife is dead, his friends are gone and all he has left is his rage. That does intrigue me and I don’t recall this era of Hulk, at all. The inside fold is promoting Disney’s Saturday morning shows on ABC. Recess (such a great show), Doug (that I barely followed), Pepper Ann (that looks familiar) and Mouse Works, something involving Micky and Minnie – I imagine. Issue opens with beloved television reporter, Trish Tilby, of CBNC News fame. She recaps the events that got us here, which I appreciate. At this point, the two titles were essentially one big bi-monthly series. Trish reports that Magneto is a “mutant terrorist” which seems unnecessarily racist. “Terrorist” is sufficient. Magneto’s latest plan, is essentially teasing what Ultimate Magneto will do, during Ultiumatum. Except here, he threatens to do it, and there, he just did it. Magneto wants to tip the planet off of its axis. He’s already began the process, and there are massive blackouts – everywhere. Magneto has sent a robot to the United Nations, to represent him as his ambassador. What is stopping Magneto, right now, is his clone, Joseph. Astra has plotted this Magneto v Joseph fight, for a while now. The caption states that she is a former Brotherhood of Mutants, but I don’t even recall her from that. 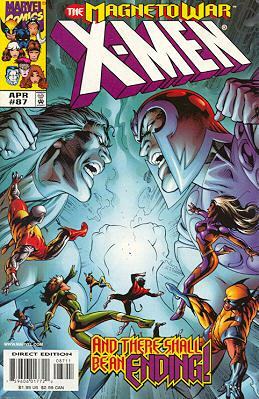 As the two fight, the X-Men arrive, in a plastic plane. I like how Xavier dressed up for this confrontation. This is a pretty good roster, for the X-Men – Marrow, Storm, Colossus, Shadowcat, Rogue, Gambit, Wolverine and Nightcrawler. No Original Five, but plenty of All New, All Different. Nearly, all of them, minus Sunspot and Banshee. Xavier explains the differences of Magneto and Joseph, which the caption boxes did the same, two pages earlier. Magneto has the experience and the will but Joseph has the raw power but lacks control. Xavier recognizes that Astra is on the field, which is something that gives Xavier an edge up, on me. Wolverine pops his claws, which is silly as he has no chance against Magneto. Xavier tells him to settle down, as he knows what I know, that Wolverine shouldn’t be able to get too close, to Magneto. Xavier calls him “Magnus” which seems like a weird time to show respect to the super villain. Xavier wants to split the team into three groups (classic X-Men style!) each to deal with the pieces on the ground – Magneto, Joseph and Astra. Since they are at the eye of the battle, Kurt feels like he should be able to safely teleport now. Astra doesn’t require an entire dedicated group, Kurt teleports to her and punches her in the face. Going after Magneto is – Rogue, Gambit and Wolverine. Which makes sense, Rogue has a romantic relationship with Magneto. Wolverine has a score to settle and Gambit goes wherever Rogue goes. Did they ever deal with the fact, that Rogue was attracted to Joseph, under the false premise that he was a younger and gentler Magneto? Only to have him be revealed to be a clone? I suppose that would have been in a X-Men Unlimited issue but they also don’t really publish those stories. 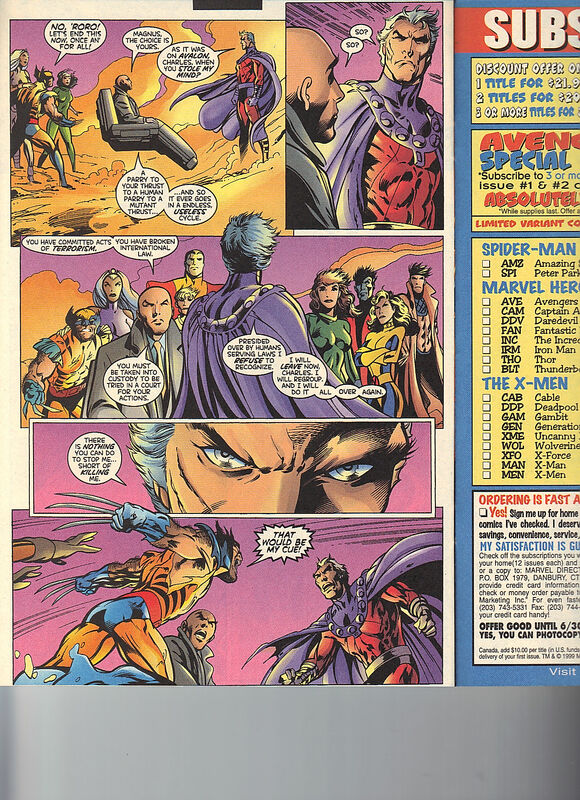 What is happening with Magneto’s face, in that last panel!?! Super menacing but also, creepy. Wolverine tries to SKRK Magneto but Magneto swats him away – as he should. Wolverine is a giant bag of metal, so he is the worst person to throw at Magneto. Gambit is curious where he ranks on Magneto’s list of mutants who matter. Magneto throws in Gambit’s face that he is a traitor to his own race. Magneto knows this, as he was the reason Gambit was put on trial, in Uncanny X-Men 350. 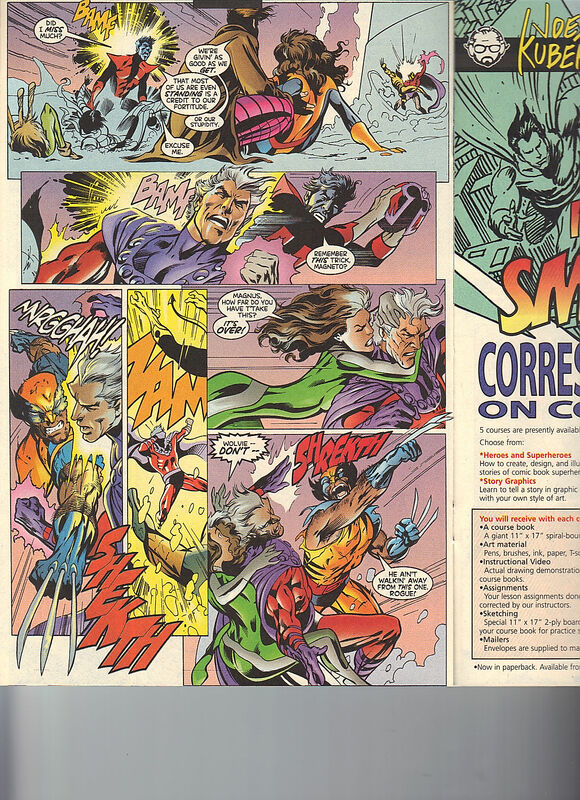 The Uncanny issues, part of Magneto War, are Uncanny 366 & 367. The other issues are X-Men 86 and Magneto War 1. Kitty and Marrow arrive, so they must have been mart of the Magneto Team. On Team Joseph, is Xavier, Storm and Colossus. Joseph, now no longer under Astra’s influence, is trying to right the world. Joseph is becoming one with the electromagnetic spectrum. Xavier is going to work with Joseph, to be his telepathic anchor. It will be up to Storm and Colossus to keep Joseph’s body intact. In classic Claremont fashion, Colossus and Storm Care Bear it up, to save the day. Colossus armors up, becoming a lightning rod. Storm works as a conduit, to seep the energies from Joseph and into Colossus. Back with Magneto. He swats Wolverine away, again. I do like how Marrow isn’t afraid of Magneto. I imagine the team educated her on Magneto but it is merely facts. They didn’t experience the menace of Magneto (or Spider-Man) in the Morlock Tunnels. Magneto has regretted not doing more, for the Morlocks. Though he did figure out who lead the Marauders to the Morlocks, though only us fans know that Magneto was Erik the Red. Strangely, the X-Men nor Gambit, ever talk about that trial. I get Gambit not bringing it up but the others, I would be constantly asking about how Erik the Red figured all of that out. I’m going on about Uncanny 350, as I no longer own that issue – due to lack of Kitty being in it. Rogue has called Magneto, Magnus and now Kitty does too. I do enjoy Magneto calling her, Katherine. Kitty was going to stab Magneto with ice! This was all the distraction that Wolverine needed to strike Magneto. 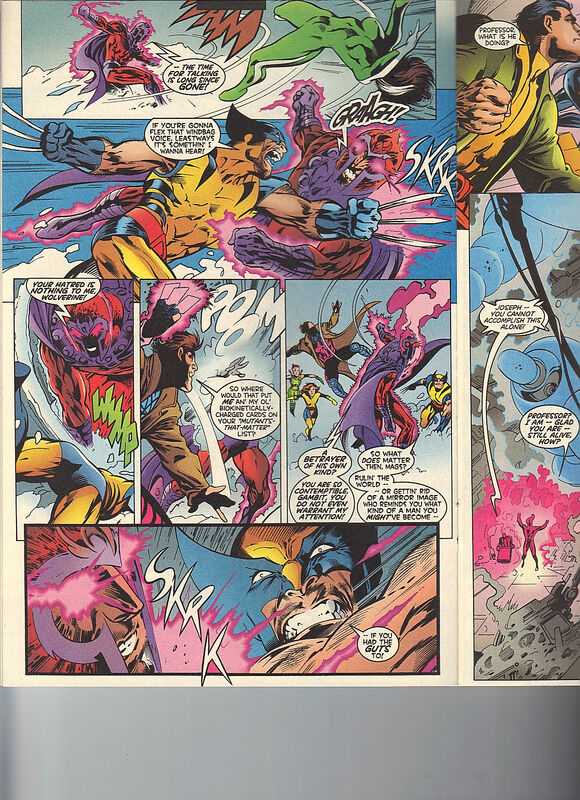 Which is also how Eve of Destruction ends, the two examples of Wolverine ever having an edge on Magneto. That happened in X-Men 113. Uncanny issues involved int hat event are Uncanny 392 & 393, so we are a few years away from that. I don’t own any of those issues, also due to lack of Kitty being in them. Decent storyline though. Joseph is merging with the magnetic field, he feels the source drawing him in. Meanwhile, at the United Nations. A guy runs into Dr. Huxley’s office, stating that the Earth’s axis is being corrected. So she doesn’t have to go through with her plan to give Magneto what he wants. She goes as far as to set the report that she is given, on fire. Kurt checks in on Kitty and Gambit (I imagine Gambit happen to be next to the person Kurt was really checking on.). 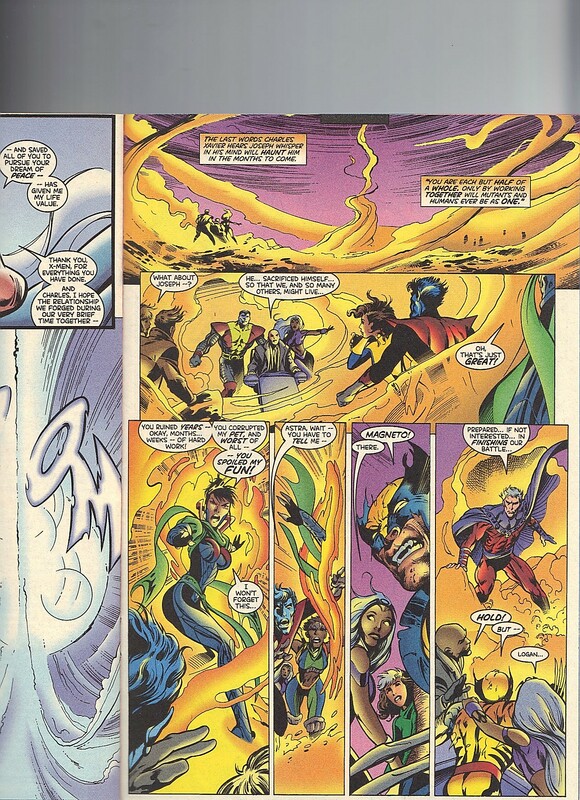 Kurt sees an opportunity and teleports over to Magneto, removing his helmet. Wolverine slashes Magneto’s face! But not that deeply, which is strange. It looks like Wolverine SHREKTH the other side of Magneto’s face, as well but it isn’t really reflected, throughout the rest of the issue – or for the rest of time. Xavier checks on Joseph, who has aged to what Magneto probably should look like. Bullpen Bulletins, I must have been reading all of the titles that came out on February 24, as they all sound familiar. Avengers 15, by Busiek & Perez, but it is dealing with Triathlon’s origins. Deadpool 27, which is odd as I know that issue 27 guest stars Wolverine and Kitty Pryde, along with Doctor Bong but the issue description describes another issue. Earth X 1 of 12, such a great series! Gambit 3, I was reading his first ongoing, at this point. J2 7, not enough updates with the X-People. Tom DeFalco & Ron Lim, riding the MC2 line, at is high point. Inhumans 6 of 12, Paul Jenkins and Jae Lee, I want to own the motion comic to this as I want to reread it but the trade is in storage, right now. Slingers 5, another amazing series! Joseph Harris & ChrisCross. Webspinners : Tales of Spider-Man 4, picking up where Silver Surfer 18 (from 1969) left off. Wolverine 137, Erik Larsen’s Wolverine Space Opera – that was pretty great. X-Force 89 – The New Hellions are back! In Stan Lee’s Soapbox, he teases James Cameron’s Spider-Man film, which still sounds bonkers to me. 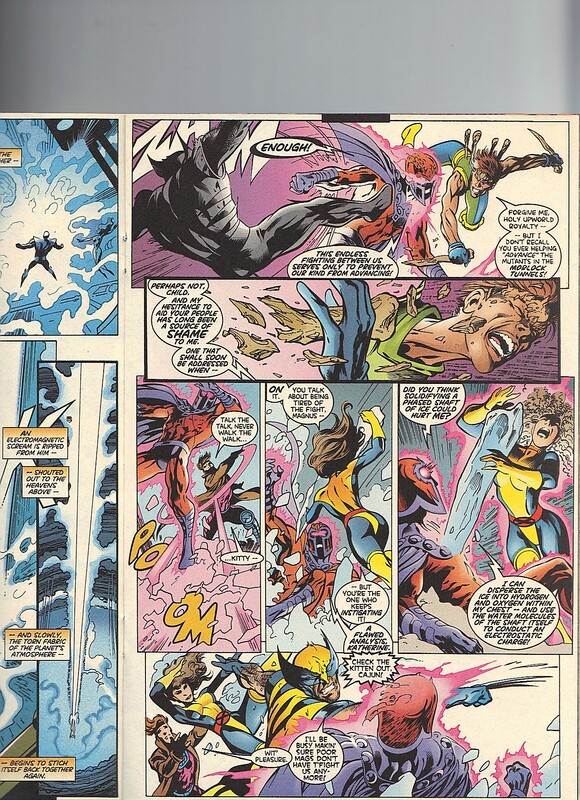 Joseph sacrifices himself, so that Xavier and his X-Men can continue his dream. 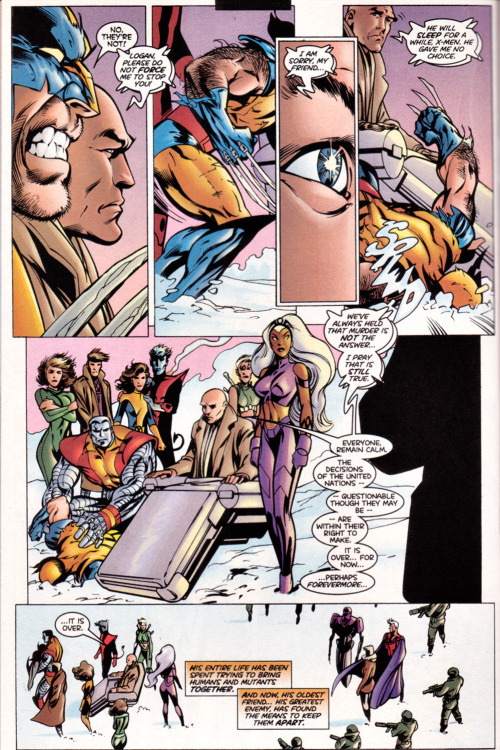 Xavier, Storm and Colossus regroup with the others – explaining that Joseph is dead. I like how Astra wants to go on about how much work went into this scheme. She has to go from years, to months, to finally, weeks. But it is pretty impressive what she was able to do, in such a short time. She disappears, through a portal, which does remind me that she did appear in Second Coming. Magneto is back, ready for Round Three! Xavier is tired of all of this senseless fighting, this cycle that goes nowhere. See Magneto’s face? Those are not very deep cuts. The way it looked, earlier, he should barely have a face! Magneto dares them to kill him, if they want this to truly end. Wolverine hears his cue and charges at Magneto. Rogue takes Wolverine down, again. Gambit finally has to question her motivations, I suppose it was one to many times. Just then, Ferris (Magneto’s robot ambassador), Dr. Huxley and some United Nations peeps (with soldiers) arrive onto the scene. Dr. Huxley hands Magneto a very important piece of paper. Magneto, if he accepts, will be the ruler of . . . Genosha! Which is pretty awesome! Wolverine’s reaction is pretty great, too! Wolverine wants to keep going after Magneto but Xavier mentally shuts him down. It is a great issue for watching Wolverine get his comeupins. 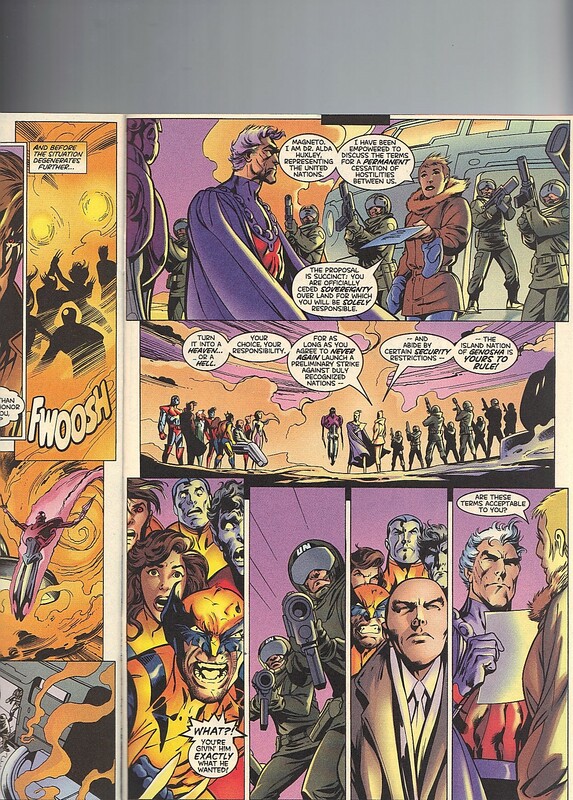 Xavier, wisely, realizes Magneto is United Nations sworn, so there is nothing the X-Men can do, so they leave. Magneto and Ferris are by themselves. Magneto tries to magnetically bring his helmet to him but it doesn’t even budge. Ferris retrieves it and asks if this is exhaustion or a problem. It will be a problem, that we will follow in Magneto Rex. Well, not us here at S&FwM as I no longer own any of those issues but the readers of the day. X-Pressions – the letters page – has letters from – James Knoles of England / Mel Molatore of Portland, OR / Tammy Suto of Rayland, OH and Barry Southgate of New Zealand. The next issue features Juggernaut. I own that issue, but who knows when I will review that.